This is a document prepared and signed by a licensed physician. It's given to people who need the certificate for various reasons. Some use it as proof that they were sick thus the reason why they skipped work or a class. Some employers may also require medical certificates from their applicants. It's also a common requirement in physically demanding sports activities like marathons, running competitions, and mountain climbing events. For example, before you are allowed to climb Mt. Pulag in Benguet, you are required to submit a medical certificate to show that you are physically fit to climb the mountain. Always keep in mind that only licensed physicians are allowed to give out medical certificates. Furthermore, you have to be reminded that issuing a false medical certificate is a crime in the Philippines. With that said, you should only seek a certificate from physicians you trust. 1. Visit the hospital, medical center, or private doctor's office where you want to get a certificate. 2. Inform the receptionist that you want to get a certificate. You will be informed on what to do next. 3. You will be given a form which you need to fill up. 4. The doctor or a representative will examine you, ask questions, query about your health history, etc. 5. After the examination, the doctor will prepare the certificate and put his or her signature on it. 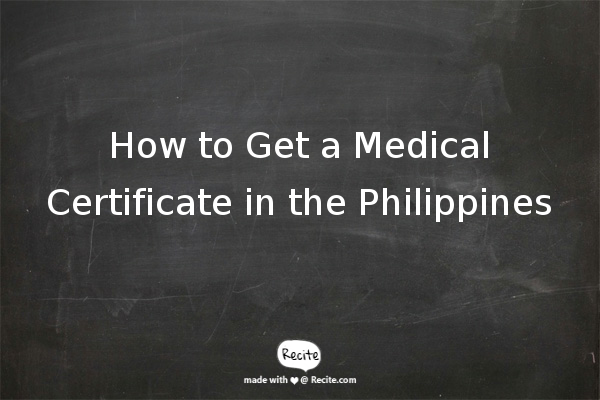 Please note that this is a simplified version of the steps on how to get a medical certificate in the Philippines. The steps may vary depending on the hospital, the doctor, or the reason why you ate getting a certificate. In fact, in some medical centers, you won't get the certificate until after a day or two. What are the requirements in getting a medical certificate? Bring an ID with you in case the physician asks proof of your identity. And of course, it's highly recommended that you answer all his or her questions as honestly as you can. We are talking about your health here. Lying about your health or history can get you in a lot of trouble. One last thing, there is no standardized format or sample on what a medical certificate should look like. It depends on the hospital, medical center, private office, or doctor who is issuing the certificate. In some instances, you can even bring a pre-printed medical certificate form with you. The attending physician will fill up the blanks after examining you then put his/her signature on it.